The meeting will be a chance to comment on the city's comprehensive plans for 194 developable acres of the project. An open house to discuss the Basalt Creek comprehensive plan is set for Tuesday, from 6 to 8 p.m., at Horizon Christian High School, 23370 S.W. Boones Ferry Road. The meeting will highlight the area's guiding document for land use for an area that will be developed by both Wilsonville and Tualatin. The area in question is a 42-acre site south of the Victoria Gardens subdivision, north of Basalt Creek Parkway and east of Grahams Ferry Road. Despite misgivings by some Tualatin City Council members, the council last summer approved a concept plan that includes 194 developable acres overseen by the City of Tualatin and another 137 acres Wilsonville will oversee. 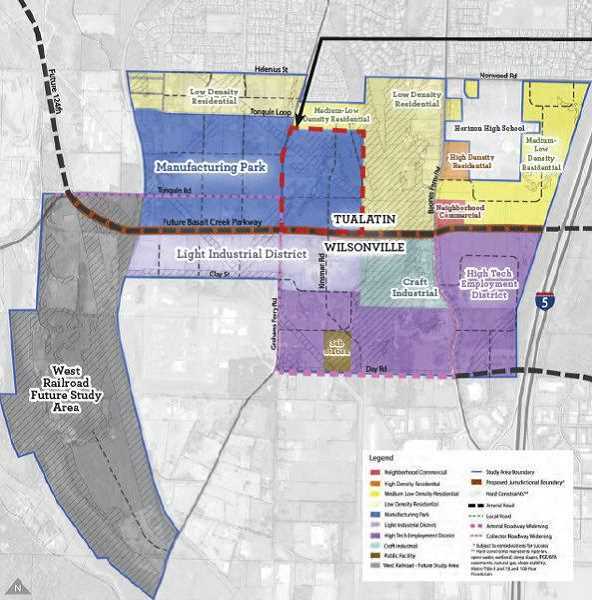 While Tualatin had wanted the portion of its property to be designated for residential development and Wilsonville had pushed for an industrial designation, Metro stepped in last month and sided with Wilsonville. The area is part of a central subarea with numerous slopes and a rugged topography, a portion of 847 acres in what's known as the Basalt Creek Planning Area.